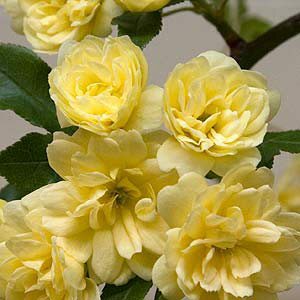 A hardy evergreen climbing rose originally from China, Lady Banks’ Rose (Rosa banksiae) is a famous vigorous climbing rose. Named after the botanist Joseph Banks it has been widely grown in Australia for many years. Drought tolerant, disease resistant and with masses of flowers this is an excellent low care rose. Long lived and very rewarding. Being vigorous, this is a plant that requires good sturdy support. Two forms are commonly available, the yellow form Rosa Banksiae ‘lutea’, pictured right, and the white form Rosa Banksiae ‘alba’. Both are reasonably drought tolerant once established the white form is scented while the yellow form is not. Lady Banks’ Rose (Rosa banksiae) is a vigorous rose, so be prepared for some pruning each year to keep under control. You will be rewarded with masses of flowers during spring. This is a rose that flowers on old wood so pruning heavily can reduce flowering the next season. Prune after flowering by removing damaged canes first, thin if needed and cut remaining canes back by 1/3. The Lady Banks’ Rose is a thornless rose so pruning is not difficult. Left to grow unchecked this vigorous grower will reach 15m (45ft) and more, although usually less.